EraseTemp is a free program that lets you automatically delete temporary files in Windows 8 PC. Unlike most of the other tool, EraseTemp automatically deletes old Temp files, by default. 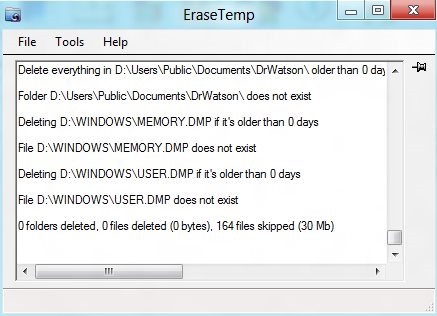 EraseTemp deletes those files which are at least one day earlier than the current date. (In short, it doesn’t deletes up-to-date or current day created files from Windows 8 PC). You need to just run the application, it automatically deletes all the temporary files from your Windows 8 PC older than the current day. EraseTemp works on command line parameters and removes the empty directories. Note: While installing EraseTemp to your PC, you need to have Microsoft .NET Framework installed to your Windows 8 PC. Automatically deletes all temporary files from your PC. Accepts the command line parameters. Deletes files which are on day earlier than the current date. Quick to get access to. Also, check out our post on Cleaner for Windows 8. Head over to the homepage to download EraseTemp to your Windows 8 PC. A zip file would be downloaded to your PC. Unzip the file on your PC. Launch the application on your Windows 8 PC. By default, it will automatically start deleting old temporary files on your Windows 8 PC. EraseTemp is an excellent tool to delete temporary files in Windows 8 PC. Go ahead and give a trial to it.